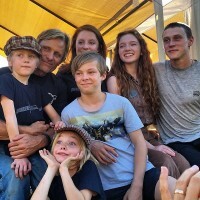 What better way to celebrate the holiday season than to have Viggo answer a few questions from us here at Viggo-Works. This is another wide ranging interview covering multiple topics with some eye opening responses from Viggo. So ... enjoy this early holiday gift. It's one package that we simply could not wait until Christmas to open. There is a saying that goes "never work with children or animals" but you've done both, and on more than one occasion. In Captain Fantastic you are taking on the role of a father with six children (and possibly some animals to look after) – how did you prepare for the character of Ben Cash? And what props have you brought to the set? Some aspects of this story I was well-prepared to deal with, thanks to my particular life experiences and affinities. For example: living in a forest in the northwest of the continental U.S.A. land mass, knowing something about the local flora and fauna and caring about them. Knowing how to prepare and care for a vegetable garden, fish, hunt, having an appreciation for philosophy, poetry, science, intellectual discussion. Having had the experience of being a father raising a child on my own, being interested in the mental, physical, and psychological evolution of children. All of these pre-existing interests helped me prepare to work with Matt Ross and his team. After living in a city for several years how good are your bush craft skills these days? I believe I'm still fairly good at gardening, and at being in the woods, finding my way, loving the night and day and the winter and summer of it. Was a little rusty at identifying certain woodland plants, but that, too, came back to me. Although it was not part of the movie story, I managed to catch some nice trout in the states of Washington and New Mexico, where the movie was shot. Only kept one, a badly hooked brown trout taken from the Chama, in Northern New Mexico. Had my fishing license, by the way, which I recommend to all anglers, be they beginners or veterans, fishing on public or private land. I ate the trout, fried with some onions and apple slices. Delicious. Thank you, Universe. In a recent interview David Cronenberg revealed that there will not be a sequel to Eastern Promises because you were unhappy with Nikolai's destiny in Steven Knight's script. You've clearly thought about where Nikolai was heading when the cameras left him sat at that table – please could you share your vision of Nikolai's future? I'd rather not say. Everyday we are new, and the challenges that we face are new. I do not know where 'Nikolai' should go, where he may want to go. These choices are very subjective, of course, but I simply was not sure that he ought to go where it seemed to me the sequel wanted to send him. Perhaps, too - and this had nothing to do with Cronenberg or Knight - I was happy to leave the fate of 'Nikolai' to the audience unless a really interesting continuation of his journey was proposed. As I say, these things are very subjective. I may have been mistaken in not jumping in and joining in the effort to set up a sequel. Who knows? You have commented on how the script for The Two Faces of January is better than the book. Is there anything in the book that was omitted but you wish it could have been incorporated into the movie? And what are your views on Chester's demise in the book? As regards the character I played in "The Two Faces of January", there is nothing of value missing from the book, in my opinion. 'Chester' is somewhat predictable in the book, and, by and large, pathetic. In Hoss' version he is pathetic, tragic, seductive, threatening, vulgar, noble, tormented, amusing, and enigmatic. That's what a gifted screenplay writer and movie story-teller can do for an audience, and for an actor. You own the North American rights to Jauja - if you are unable to find a distributor who is interested in releasing it on DVD will you consider releasing it yourself through Perceval Press? Fortunately, Cinema Guild, a company with a great catalogue of ground-breaking international movies, has bought the rights to the USA. I hope that we at Perceval Pictures get lucky in Canada as well. What is the slow song heard on the soundtrack of the Jauja movie? Is it a traditional song or did you compose it? Both tracks are from the album PLEASE TOMORROW, which is made up of recordings of compositions that came to me some ten years ago, made in happy collaboration with one of the world's greatest living guitar artists, Buckethead. Lisandro Alonso has suggested you write a script for him based on an idea that you have discussed. Is script writing (for others) something that you are likely to consider in the future? I have not thought to write for others, to be honest. I have written a couple of screenplays, thinking I might make movies from them some day. Crowd-sourcing is now a popular way of getting funding for projects. What are your opinions on sites like Kickstarter and would you consider using them yourself for Perceval Pictures projects? Not at this point. Things change, though. Who knows. You have embodied some characters that have strong cross-cultural resonance. What do you think are the important life lessons you have absorbed from playing Frank Hopkins, Alatriste, Tom Stall, The Man and Sigmund Freud? We all suffer, and we will all, most likely, die one day, but we all have the potential to laugh at life, to enjoy it. Learn from it. Redemption will not necessarily result from an effort to share and rejoice in any sort of shared existence, but it is certainly more fun along the way. As far as cross-cultural aspects of characters go, this past year or two, with 'Ben Cash', 'Gunnar Dinesen', and 'Daru' (from, respectively, "Captain Fantastic, "Jauja", and "Loin des hommes"), I have been all over the map mentally and physically. Saying so is, I suppose, a sort of cliché, but these experiences have reinforced my pre-existing opinion that people are more alike than different, that it is easier to get along with than to fight the "Other". Is there any character you would feel uncomfortable playing in a movie (and would probably turn down if you were offered a script)? Is there any public figure from the past or present that you would like to play? Not necessarily. If pressed to think about it, I suppose I could name a person, but I would rather keep that to myself in case i get a good idea for a movie or a poem from thinking about that person. You will be returning to the stage in Barcelona as part of the "Solos" series – do you already have a good idea of what you will be performing during your hour? I will read poems. A friend who is a gifted pianist, Raffel Plana, will most likely play that night as well, perhaps even some pieces I've recorded previously. How do you feel about the use of photoshop technology to edit and manipulate images? Do you think it is still "art"? It is a matter of degree, like digital "fixes" and enhancements in movies. You have a shotgun, say, and limitless ammunition. How many ducks do you need to shoot, how many can you eat in one sitting? Do you ever purchase work by other artists? If so, what was the last artwork you purchased and why? Occasionally. There is so much clutter in my life, there are so many things I have collected over the years, that I can only find room for so many to be hung on the wall or displayed on a shelf. The rest is stored or given away. The last artistic objects I purchased were paintings by Minerva Chapman. I hope to one day present an exhibition of her paintings and drawings in order to help create greater awareness of her accomplishments as an artist. If you could live in any painting which would it be and why? Very good question. So many possible choices. 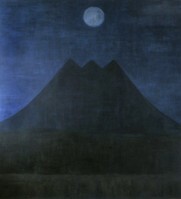 I would be happy, I believe, in any number of Georg Gu∂ni paintings. What five songs do you regard as being the soundtrack to your life? Can't narrow it down that much. Also, further complicating any reasonable answer I might give, is the fact that the soundtrack, like the life and its inspirations, changes all the time. Yes, but I decided that I would rather make short stories and poems. Is there any city or country that you haven't been to but you would like to visit someday? New Delhi, Ankara, Yerevan, Abidjan, Tripoli, Tbilisi, Nairobi, Kathmandu, Jerusalem, Islamabad, Baghdad, just to name a few capitals of the world. I'd like to get to know the north of Siberia and to sail across the Pacific Ocean. Swim in every sea, climb every mountain, know every tree. I know that is impossible, of course. In a recent Sobrevuelos column you mentioned Hokkaido – what was special about your experience there? Was it Hokkaido or Hiroshima? In any case, now I am thinking about Hiroshima. Its river, the bay, the mountains beyond, the sky that is no longer the sky that the atomic bomb fell from almost seventy years ago, the way that people continue to live their lives there. I also think of Nara and Kyoto, of the beautiful wooden houses that have been built the same way for centuries. And those houses make me think of the wooden ones that burned as a result of the U.S. Air Force fire-bombing Tokyo during World War Two. Does your love for San Lorenzo give you an empathy towards your own fans? What are your thoughts on fandom in general? Like any human behaviour, football fan behaviour can be empathetic, respectful, peaceful, and joyful - or it can be indifferent, disparaging, violent, and disagreeable. There is a special, subjective bond I feel I have with Cuervos, but the same rules apply to them and to me, I feel, as regards human behaviour. I relate to those who respect their adversaries and know how to lose and win with dignity. What are your views on Qatar being awarded the 2022 World Cup? A crazy idea. Humans can be ingenious, however. Perhaps it will be made to work, no matter how hot the temperature is on the field and in the stands. The disregard, thus far, for human life in the process of constructing the event's facilities is inexcusable, horrible, unforgettable. On a scale of 1 to 10 (with 1 being 'not very' and 10 being 'very') how disappointed are you with Obama's second term and why? 10. As disappointed as I could be. He could have tried a lot harder, he could have made the difference he said he wanted to make. He was stymied by the Republican corporate shills and the Democratic mercenaries, yes, but he also made plenty of opportunistic and "safe" choices that had nothing whatsoever to do with the real interests of the people, or, certainly, the interest in world peace and understanding that he purported to be a proponent of. In the end, he is one more in a long line of warmongering, self-serving U.S. presidents, only, in his particular case, one with an unusual gift for speech-making and a good dose of personal charisma. The apparently inherent (and certainly self-proclaimed) promise of Barack Obama makes all the more disappointing his mediocrity as a two-term president. Business as usual, I'm afraid. And finally – Do you have a professional Bucket List? In other words, what professional goal/s do you still want to accomplish? No, or at least I cannot think of any at the moment. I'm open to new ideas and challenges, however. I manage to keep an open mind most of the time, which is probably the greatest feat I can handle or aspire to managing.